This is a wilderness area that provides habitat for a variety of snakes, including rattlesnakes. This is no reason to avoid the area, just remember to wear heavy pants and high boots and avoid putting hands and feet into crevices that you can’t see into. People who encounter rattlesnakes along trails should detour around them and go on their way. Rattlesnakes will not chase after people and cannot strike beyond the length of their body. Vaseux Protected Area was established to provide increased representation of the Southern Okanagan Basin ecosection. The area also protects a number of blue and red listed species and their habitat, as well as protecting important sheep habitat. This area is contiguous with several lands already protected for conservation purposes thereby forming a signifacant conservation area. The entire area is zoned as Special Feature to highlight its importance as habitat for California Bighorn Sheep. Dogs are not permitted in Vaseux Protected Area. Their presence can disturb the California bighorn sheep that depend on the area for survival. The extremely hot, dry Okanagan climate can result in overexposure to the sun. Visitors should use a sunscreen and wear a hat during long periods in the sun. Hikers are reminded to bring plenty of water since there is none available in the park and to consider scheduling their activities to avoid the heat of the day. The value of the park lies in its rare wildlife. Tread lightly wherever you go. Use only established trails to help minimize disturbance and prevent the spread of unwanted plant species. History: Vaseux Protected Area was established on April 18, 2001 as a result of the Okanagan-Shuswap LRMP process. Cultural Heritage: The Vaseux Area has some of the most diverse and abundant intact archaeological sites in the Okanagan. Among them are: rock shelters, shell middens, cache pits, drying rocks, quarry sites and burial sites. These sites are of immense value and any disturbance of them is strictly prohibited. 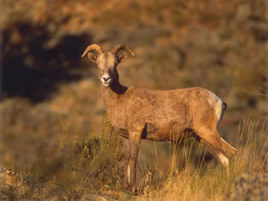 Conservation: The primary role of the protected area is to protect low to mid elevation grasslands that provide critically important winter range for California bighorn sheep. Old-growth larch stands provide important habitat for White-headed woodpecker and Williamson’s sapsucker. Red and blue-listed plants in the area include Mousetail and Bearded sedge. Douglas-fir-Ponderosa Pine/Idaho fescue is a blue-listed plant community. Wildlife: California Bighorn Sheep are a focal species in the area. However, there are many other rare and endangered species being protected. There are two red and seven blue-listed mammals (including the Pallid bat and the Western red bat), 11 red and nine blue-listed bird species (including the White-headed woodpecker) and one red and five blue-listed reptile species (including the Night snake). Vaseux Protected Area Approved Management Direction Statement [PDF] is available online in pdf format. The protected area is open to hunting. For more details, see the BC Hunting and Trapping Regulations synopsis. Horses are permitted, but off-road vehicles are not permitted in the park. There are wildlife viewing opportunities. McIntyre Canyon and Vaseux Creek are great viewing opportunities. The bighorn sheep are a delight to watch.